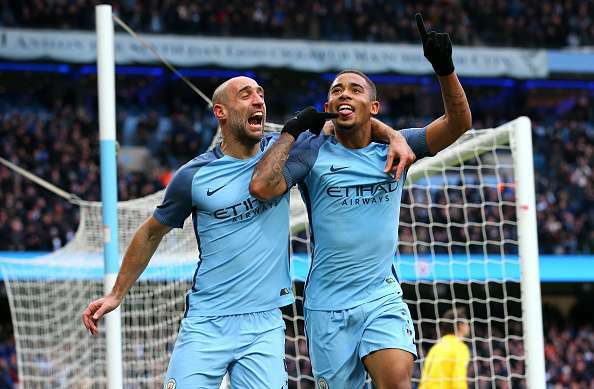 Manchester City overcame a spirited performance from Swansea City to run out 2-1 victors at home and closed the gap on the pacesetters Chelsea to 10 points. It was their wonder boy Gabriel Jesus who opened the scoring in the 11th minute when he applied the finishing touch to David Silva’s moment of magic. Despite playing second fiddle for most parts of the game, Swansea finally found the equaliser in the 81st minute through the ever reliable Gylfi Sigurdsson. However, their joy was short-lived as Jesus scrambled home a winner in the added time of the 2nd half to relegate the visitors to the 17th spot. Here are the player ratings from the game. 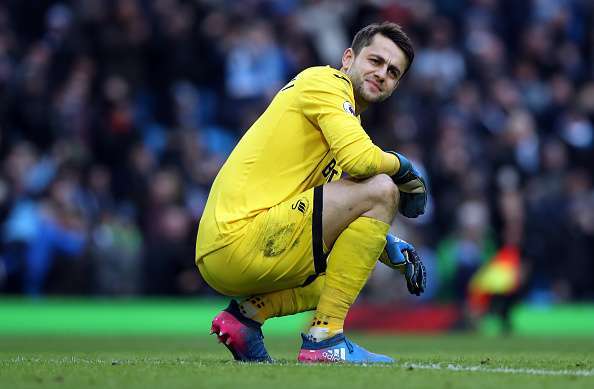 After being a spectator through the first half, the Manchester City goalkeeper was called into action to keep out a goal-bound Gylfi Sigurdsson in the second half. However, he could do very little to keep out Sigurdsson's well-placed shot to draw the visitors level. John Stones put in one of his tidy performances on the evening against Swansea. While he could have done a little more to close down space on Sigurdsson for the Swansea goal, the defender was very calm with and without the ball and led the City defence with the required solidarity. The make-shift centre-back put in a good performance and showcased an ability to read the opposition’s moves. 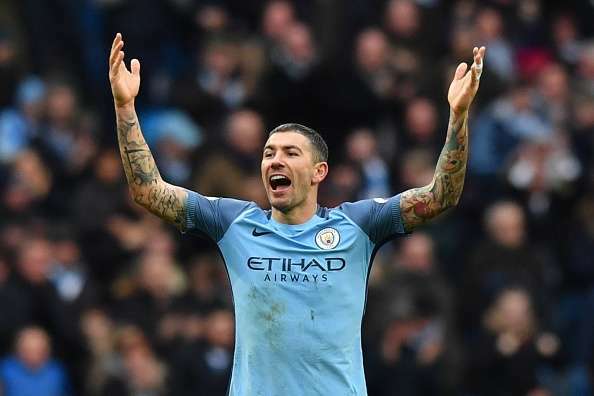 Given Vincent Kompany’s injury record as well as Pep Guardiola’s willingness to mix things up, Kolarov is being touted to be the partner for Stones at the heart of the Manchester City defence and the Serbian defender repaid his manager’s faith in full. The French defender did well to deal with the pace and skill of Wayne Routledge and was one of City’s best defenders through the game. However, that did not deter him from going forward and Clichy remained a constant threat to the Swansea defence with his probing runs. Deployed at right-back for the game, Fernandinho looked jittery at times with his passing. However, he grew as the game progressed and ensured that the Swansea unit did not get the required space and time to operate in for most durations of the game. The Ivory Coast international revelled in a deep-lying role with his range of passing as well as the ability to disrupt the opposition’s rhythm. He was tidy in possession and his passing, made some crucial tackles and was a constant force to deal for the Swansea midfield through the game. Silva pulled the strings at the heart of the Manchester City midfield throughout the first half and created his side’s opening goal for Gabriel Jesus. After kept silent by the Swansea midfield for large durations of the second half, the Spaniard finally found his groove and assisted the all-important winner for Jesus. As has often been the case with de Bruyne, the Belgian showed great incisiveness to his game throughout the first half and great link-up play with his attacking colleagues. However, his impact on the side was reduced in the second half as Swansea came out all guns blazing and the midfielder was deservedly substituted. This was the Raheem Sterling we have gotten used to. He complemented his teammates’ creativity by getting into good positions on the pitch. However, his final delivery was poor leading to frustration from the home supporters. Like Sterling, Sane too complemented his teammates’ creativity by making some good incisive runs through the Swansea defence. However, his final delivery was poor and for Sane to truly return the huge investment made by the club on him, he will have to improve on that aspect of his game. The Brazilian was the star of the show yet again as he grabbed a brace to help his side overcome a spirited Swansea side. However, that is not all that impressed us. He showed good link-up play, got past his man often and was also a constant threat to the Swansea defence. The 19-year-old already looks like a star and if his performances are anything to go by, Jesus is here to stay. Zabaleta came on in the 78th minute to add some solidity to the Manchester City defence. The Argentine started the game on the bench and when he did come on, he missed a gilt-edged opportunity to add to his side’s lead during his time on the pitch. Despite City’s dominance throughout the game, the Polish keeper had very little to do. 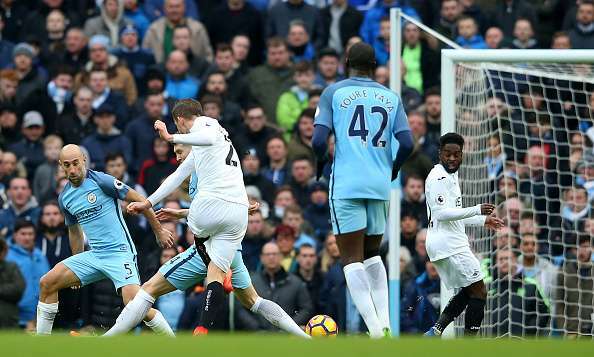 However, a large majority of the Swansea supporters will believe that he could have done well to collect Jesus’ header that led to City’s winner. Olsson was willing to get forward to help the cause of his side throughout the game and troubled the City defence. However, he failed to deal properly with the presence of Sterling and de Bruyne and offered them time and space to operate in. Mawson was lucky to not concede a penalty in the first half but did improve as the game wore on. He made some crucial tackles through the game. However, he failed to track Jesus’ movement late in the game and could be deemed responsible for his side shipping the 2nd goal. 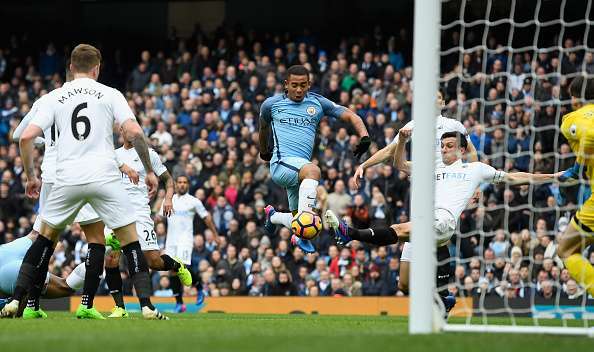 The defender was a towering presence in the Swansea defence and made some good clearances as well as interceptions to deny the City attack. He was left red-faced by Silva, who nutmegged him before assisting Jesus’ opening goal. Naughton had his hands full for large durations of the game with Sane constantly getting past him with his pace and skill on the ball. He, along with Mawson, failed to track Jesus’ run for the 2nd goal and it was truly an evening to forget for the former Tottenham man. The midfield powerhouse proved to be a tough player to get past for Manchester City with his tenacity during the opening stages of the game. However, he proved to be no match for the marauding Yaya Toure who had one of his better games of the season. With Swansea finding themselves in a dire situation, Fer needs to step up and be the player he can be. Carroll is a player who thrives on his passing ability. Given that his side enjoyed very little possession and were largely restricted to their defensive duties, Carrol could do little to enforce the game. The Iceland international was left redundant for large durations of the first half and only sprang to life in the 2nd half, when he forced Caballero into making a smart save. He followed it up with a great goal with his left-foot to bring his side level and was thereafter dealt with well by the City defence. Routledge was largely restricted to defensive duties with his side showing no ambition of getting forward and was kept silent for large parts of the game. Given Swansea’s lack of ambition, Llorente was denied the kind of delivery he requires in the box and had to battle it out alone whenever presented with an opportunity. Dyer came on in the 75th minute to replace Carroll and showed glimpses of his pace going forward. Swansea City’s recent recruit was a willing runner after coming on in the 65th minute for Routledge and probed the City defence with his pace and power.